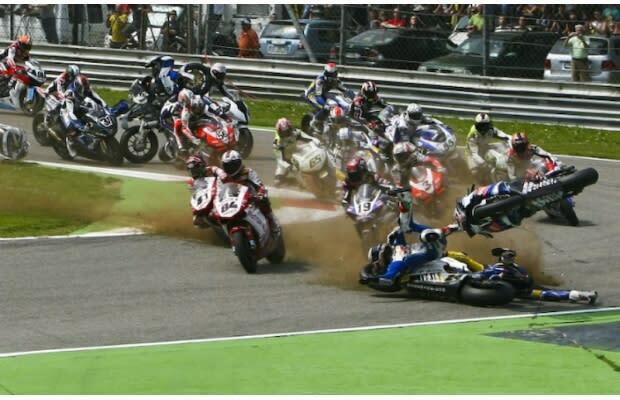 Complex Says: Max Neukirchner was involved in a pileup at Turn 1 of the Monza WSBK circuit in May 2009, breaking many bones in his right leg and foot. By July, Neukirchner felt fit enough to go to Imola's World Superbike Test Week. During the second day of testing, Neukirchner had a massive high-side and landed hard on his back, fracturing several vertebrae, requiring surgery. His team, Alstare Suzuki, cut him loose after all this in favor of a fitter rider. Neukirchner made a full recovery in the off-season, then came back with a different team in 2010 and eventually moved to the Moto2 series. He showed a lot of promise early on in his WSBK career, even seeming like a potential title candidate in 2009. We hope the stars align so that he can live up to that potential.